A class is created just like a module. 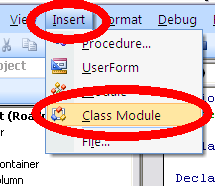 By default it will create a module called 'Class1'. First job is to go to the properties tab and rename it to something sensible. The 'standard' naming convention is clsYourClassName, however I personally use c prefix rather than cls. 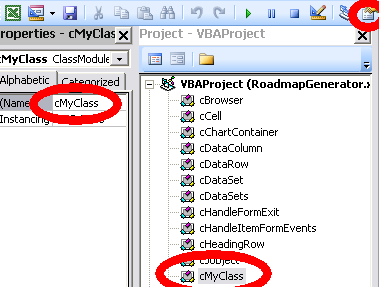 This class module is your vba class constructor. Properties are generally values (or values derived) from variables that are stored along with an instance of a class. Here is some code showing our class with a single property named 'Key', I use a naming convention pPropertyName to identify these easily. Private is like Dim in a regular module , and its position before any procedure code directs that the value pKey is accessible by every procedure within this class, but is not visible to any other procedure outside of this class module. This technique ensures that an instance of this class allocates the space to preserve a private copy of the variable pKey. To get the value of pKey in and out of the class, Public (meaning accessible to other procedures outside this class) Properties Get Key() and Let Key() have been defined. Since there is both a Get and a Let, this means this is a property that is both readable and writeable to outside procedures. In summary then, the only way to change or read the value of pKey (which is a private variable only visible inside this class) is through the public property object.Key. This concept is fundamental so if there is one thing you need to 'get', it's this. Since we have already created our class of which mc is now an instance, the IDE will automatically will bring up the available public properties, just like it does with inbuilt Excel classes. In this case, only Key. A method is a procedure that operates on a class, sometimes returning some value. Usually when you create a class you want to populate it with some initial values, and perhaps set up some kind of other structures. I generally create a method called "Init"to do that. Other languages have special methods called constructors that are called on the instantiation of a class. I kind of like the idea of initializing it when I want to. We are now going to extend our class to contain a couple of new properties and also a collection. The concept here is that this class will have 'children' of the same class. A very common technique for setting up tree structures. This will all be done in the .Init method. Note also that I return the object "Me" from the .Init method. This is because it can be useful if the .Init is used as a call to some other procedure. In a class "Me" always refers to the instance of the class that is currently being referenced. and an example using it. Since the .init() method actually returns 'Me' - the instance of the class, we can short circuit all that by calling init and passing the returned 'Me', to the .add() method of the collection. Below is the whole thing. Of course, the children could have children and so on. This is where classes become so important if you are considering using recursion. See Getting started with recursion for this example taken a little further. Classes are used in every project on this site so anything you download will contain examples. For more information and examples of classes take a look here. In the meantime why not join our forum,follow the blog or follow me on twitter to ensure you get updates when they are available.